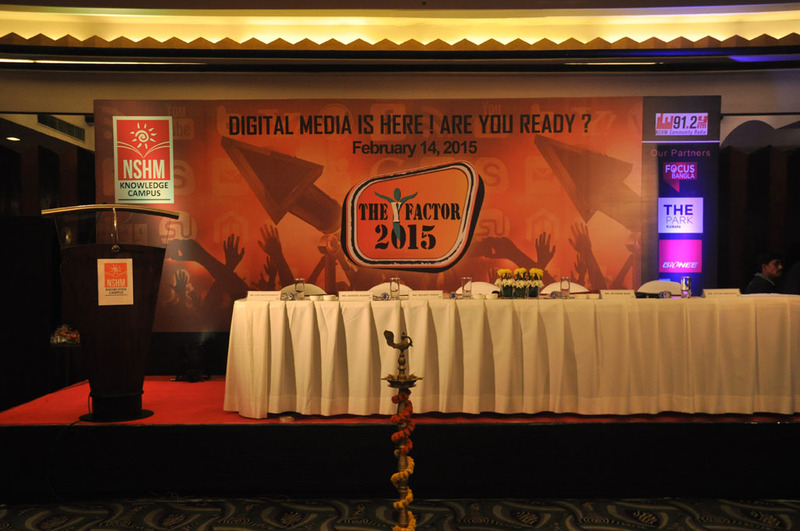 NSHM Institute of Media & Design (NIMD), the largest media school of Eastern India, hosts Y-Factor; the annual multi-city media seminar. Y Factor is a flagship event of NSHM institute of Media and Design where stalwarts from the media and entertainment industry come together for a panel discussion on a burning topic of our time. Currently in its eight successful year, the topic debated was ‘Digital media is here, are you ready?’ The delegates in the panel were Nilasish Basu, Strategist, Digital Marketing Google, India; Sameer Hashmi, BBC World News India Correspondent; Sevanti Ninan, Indian media critic & editor of thehoot.com and Uttam Sengupta, Deputy Editor, Outlook. The session was moderated by Atri Bhattacharya, Principal Secretary, Information & Cultural Affairs, Govt. of West Bengal. This year the seminar explored the burning topic of the relevance of digital media. All the delegates deliberated on the relevance and its growing importance in India. With the advent of the global village, digital media has occupied a major proportion in our lives and has seamlessly changed from a habit to a necessity or we dare say, an addiction. From Politics, the Prime Minister to the newly established business venture next door, all diverse fields today merge at the common platform of digital media. While India maybe soon topping the chart for internet consumption, strangely majority of the population have never even accessed the internet. Such points are notably baffling and must be pondered upon. Questions relating to challenges faced by television and print media against digital media credibility, efficiency and reach of digital media in India and its impact on public relations, performing arts and media consumption patterns on the Indian population were raised.